Wrigleyville is one of the smaller neighborhood enclaves that can be found in the larger Chicago community area of Lakeview. A rather unique neighborhood, Wrigleyville surrounds one of the main Chicago landmarks – Wrigley Field. Numerous bars, restaurants, and memorabilia shops can also be found in Wrigleyville, and when there is a Cubs game going on, the local streets and businesses tend to be packed with people. Wrigleyville isn’t just a fun place to visit when baseball games are being played, however. This enclave with its spirited vibes is pretty lively almost all the time. There is no denying that Wrigley Field is the main attraction in the North Side Chicago neighborhood of Wrigleyville. Built in 1914, this iconic sports venue sits on an irregular block and is bounded by Clark Street, Addison Street, Waveland Avenue, and Sheffield Avenue. Waveland Avenue and Sheffield Avenue run along the outfield walls of Wrigley Field, and they are where you will find the famous Wrigleyville rooftops. This is the generic name for the rooftops of various residential buildings that are situated along Waveland and Sheffield avenues. From these rooftops, it is possible to watch in on Cubs games and other Wrigley Field events. Over the years, the owners of the Wrigleyville rooftops have taken advantage of their rooftop views, adding seating and charging admission. In addition to privileged Wrigley Field views, the Wrigleyville rooftops offer food and beverage service, as well as an assortment of other amenities that can help you and your group make the most of your rooftop experience. The bars in Wrigleyville are some of the most popular bars in Chicago. This can also be said about the Wrigleyville restaurants, which tend to double as bars. Especially popular in the summertime, the Wrigleyville bars and restaurants line the local streets in good number and are often overflowing with patrons both day and night. As you might imagine due to the presence of Wrigley Field, many of the Wrigleyville drinking and dining establishments have a sports bar theme. You can also find other kinds of bars and restaurants in Wrigleyville. Perhaps a tapas bar will suit your fancy, or maybe you’ll be tempted by the irie vibes at the local reggae club. Since Wrigleyville is quite compact and easy to navigate by way of foot, the neighborhood is ideal for bar and restaurant hopping. Hotels in the Wrigleyville area can make for excellent Chicago travel bases. Many people who are in town to see a Cubs game definitely look to book a room at such hotels, and nightlife enthusiasts should also find the general area to be a good fit. The proximity of the Wrigleyville area hotels to any number of other North Side attractions only lends to their overall allure. 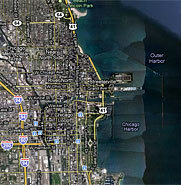 Lake Michigan and Lincoln Park are just a short walk away, for example. It also doesn’t take very long to get from the Wrigleyville area to the downtown Loop district of Chicago. Technically, there aren’t any hotels in Wrigleyville proper. Plenty are close enough, however. Examples of nearby hotels include the Majestic Hotel, the Best Western Plus Hawthorne Terrace (pictured), the City Suites Chicago, and the Old Chicago Inn. If you want to expand your lodging options even further, there are several good hotels in the southeastern Lakeview area where N. Broadway, N. Clark Street, and W. Diversey Parkway converge.